July 9, 2018-Predators—the hunters of the animal kingdom—are an important part of a healthy ecosystem. They help cull vulnerable prey like old, injured or sick animals. This provides more food for the survival of healthy prey animals and may also help slow the spread of disease. Many people know about popular predators such as sharks and tigers, but the ABQ BioPark is home to a variety of hunters from bugs to birds to mammals. Learn more about the predators at the Zoo, Aquarium and BUGarium. As its name implies, the Brazilian whiteknee tarantula is native to the Amazon Basin in Brazil. Learn more about how this large tarantula species hunts its prey from ABQ BioPark Curator of Entomology Jason Schaller. The fossa is the largest mammal predator on the island of Madagascar. Up to 50 percent of this animal's diet consists of lemurs. According to ABQ BioPark Mammal Curator Erin Flynn, the fossa is an excellent climber—they hunt and pursue their prey both in trees and on the ground at any time of day based on what’s going on around them. "They ambush their prey and catch it with their jaws and razor sharp front claws," said Flynn. "These incredible predators also have flexible ankles that allow them to climb down trees head first." 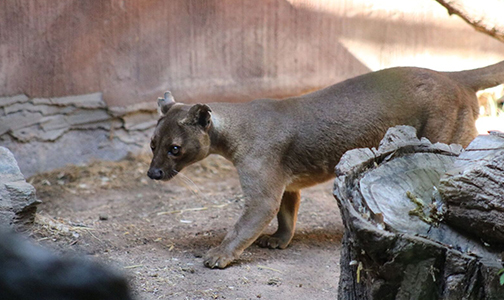 You can visit Mac the fossa (pictured above) on the Catwalk at the ABQ BioPark. Check out this video of a wild fossa climbing and leaping. This large African bird eats mostly fish, frogs and crabs with the occasional small bird or reptile. Learn how saddle-billed storks use their trademark bill to capture their prey from ABQ BioPark Senior Zookeeper Ashley Bauer. When hunting for fish underwater, the tentacled snake doesn’t aim for the fish’s initial position and then adjust its direction as the fish moves (this is how most predators do it). Instead, it heads directly for the location where it expects the fish’s head to be. But that's not all—learn more about this little-known snake's unique hunting methods from ABQ BioPark Supervisor of Reptiles Matt Eschenbrenner. Although often misidentified as “starfish” sea stars are not related to fish at all—they are actually echinoderms, meaning they are related to sand dollars and sea urchins. They have the peculiar ability to regenerate any part of their body, but have an even more peculiar way of eating, says ABQ BioPark Senior Aquarist Madeline Gandara. They protrude their stomach lining so they can digest food—such as small fish or oysters, which are larger than the sea star—externally. The soft tissues of the victim are then sucked into the sea star's body in order to absorb nutrients. Because they are very slow, sea stars use their keen sense of smell to detect prey. They generally take on animals that are slower than them, stationary or too weak to escape—then they approach it and it eat whole.